In a bowl, combine the turkey, quinoa, cilantro, taco seasoning and a pinch of coarse salt and pepper. Using your hands, pat the meat out into 4 equal sized patties. Heat the oil in a large sauté pan over medium. Add the patties, cover and sear for 4 minutes. Flip and sear another 4 to 5 minutes, until the meat is cooked through. While the meat rests, add a little more oil to the pan. Add the kale and garlic, sauté for 3 minutes, or until the kale has slightly wilted. Create your burgers. 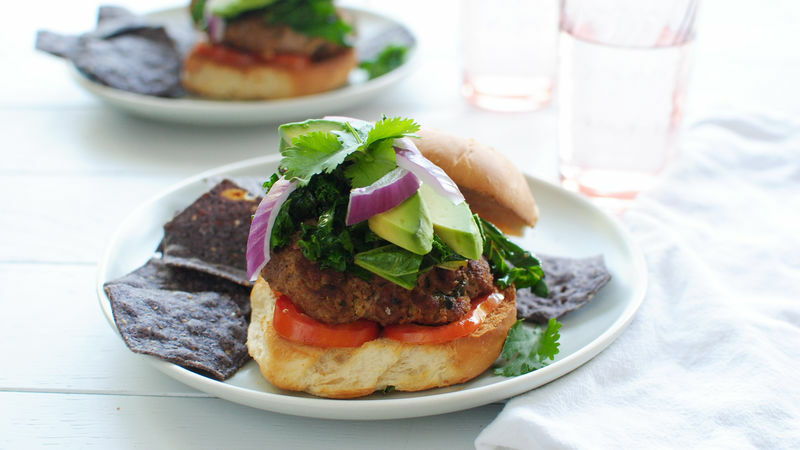 Layer with tomato, patties, kale, avocado, red onion and more cilantro. Serve immediately with Food Should Taste Good™ tortilla chips. Can't stop eating the burgers. Won't stop eating the burgers. But but but! It's healthy, yo. Listen up. Hark to the hark. We've got ground turkey and quinoa. We've got gawgeous sautéed garlicky kale on top. We've got garden fresh tomatoes and creamy slices of avocado. We've got a ring on it, basically. These are great for weeknights when you just NEED dinner to be on the table, like 5 hours ago. Super quick. Super dern good fer ya. And super yummy to the tum - yeah I don't really need to say that. Ew. Start by combining some ground turkey with cooked quinoa, cilantro, Old El Paso taco seasoning and a little salt and pepper. While the meat rests, go ahead and get your kale and garlic nice and sautéed and wilted and pretty. Then you just layer! I started with tomato on the bottom, then the patty, then the kale, then some avocado, red onion and more cilantro! I left off the cheese because I'm a complete idiot. Ugh. You should add cheese. I mean my gosh. Bev's going to add cheese to hers next time. And by next time she means now. For more musings, visit her blog Bev Cooks and her Tablespoon profile.